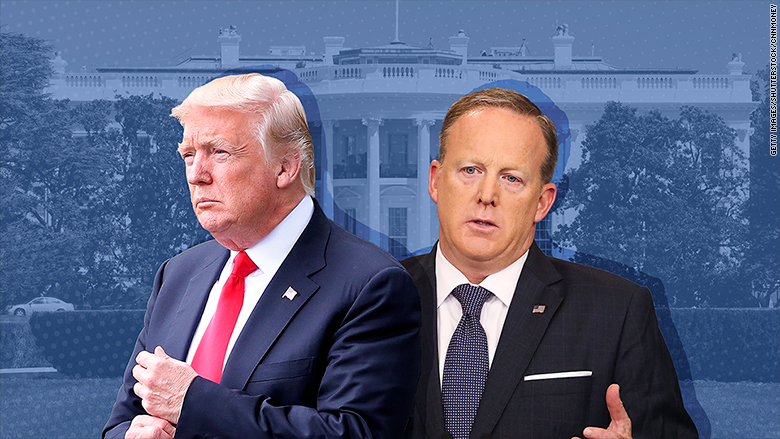 Five months into Donald Trump’s presidency, White House-media relations are hanging by a thread. The White House is facing daily criticism from the news media over its decision to reduce the frequency of press briefings and hold some of those briefings off camera, depriving the public of a chance to see White House officials answering questions. Meanwhile, the White House has grown extremely critical of the media for what administration officials describe as biased and sensationalized reporting by grandstanding journalists. In the middle is an overstretched and understaffed communications team that has spent over a month unsuccessfully looking for new staff to help relieve some of the pressure. So far, all that search has revealed is that the people the White House wants aren’t interested in the job and the people who are interested in the job aren’t wanted by the White House. Amid this chaos, the White House press office has opted for an ad-hoc strategy intended to screw with the media — the language used inside the White House is stronger — and make them look ridiculous. It will go several days without a briefing; then, when media frustration over the lack of access reaches a fever pitch, it will hold a conventional briefing. The next day, it may hold the briefing off camera, starting the process over again. Related: Why are these White House briefings heard but not seen? The result is a toxic relationship between the White House, which thinks the press should be less adversarial, and the media, which believes its job is to be adversarial. Both sides believe the other side is acting in bad faith, and both are losing respect for one another. And the frayed relationship is occupying more and more of everyone’s time, creating a distraction from issues of greater concern to the general public. This article is based on extensive conversations with three senior White House officials who requested anonymity, as well as several White House reporters who requested the same. For the time being, White House-media relations are likely to get worse before they get better. With the approval of the president, White House Press Secretary Sean Spicer has been looking for a replacement press secretary so he can focus on broader strategy. But good replacements are hard to come by. The White House has a shortlist of candidates it would like to bring on board, including, most notably, the popular conservative pundit Laura Ingraham. But so far, no one on this shortlist has accepted the invitation. Ingraham, who declined to comment, has given no public indication that she wants the job. She is already highly paid for her work as a right-wing radio host and Fox News contributor, and has said she might run for Senate from Virginia next year. Meanwhile, there are people who might like to have the job but don’t have enough support from Trump’s inner circle. Earlier this month, for instance, the Daily Mail’s U.S. political editor David Martosko met with Trump in the Oval Office to pitch him on participating in a book he wanted to write about Trump. During the conversation, Martosko offered the president advice on how to improve his administration’s communications strategy, prompting the president to recommend that he meet with Spicer about coming on as press secretary. Some in the White House, including Trump’s son-in-law Jared Kushner, thought that would be a good idea. But most senior administration officials, including Chief of Staff Reince Priebus and Chief Strategist Steve Bannon, immediately opposed the idea and put the kibosh on it before it was ever seriously considered. Kayleigh McEnany, a pro-Trump CNN contributor, is another name that has been suggested inside the walls of the White House only to be quickly shot down by several senior administration officials. Kimberly Guilfoyle, a Fox News host, publicly announced last month that she was in conversations with the administration about replacing Spicer — but White House sources said she was never in serious discussions for the position. There is no guarantee that a new press secretary would alleviate the current pressure on White House-media relations or lead to any consistency in the daily press briefing. President Trump and senior White House officials have long felt that many reporters in the briefing room are more interested in grandstanding or getting into confrontations with the press secretary than they are in actually learning new information or pursuing a story. They believe the reason reporters care so much about having the briefing on camera is because the reporters want to be seen asking questions and making the White House look bad. On occasion, the White House has decided to forego the briefing or hold it off-camera in part to deprive media organizations and journalists of the footage. Several media organizations and reporters have responded to these moves by accusing the White House of eroding long-held standards of accountability and transparency. CNN Senior White House Correspondent Jim Acosta, ABC News Chief White House Correspondent Jonathan Karl and other correspondents have become outspoken critics of the administration’s behavior both on air and on Twitter. Reporters who spoke with CNNMoney also said they view the White House’s complaints about grandstanding as a lame excuse from an administration that isn’t confident enough in its own message to face the press on camera on a daily basis. The media wouldn’t have to make such a big deal about access, these reporters said, if the White House would just do what every other administration has done and hold daily on-camera briefings. Meanwhile, President Trump continues to berate the media in public statements even as he courts them in private. “We will never be intimidated by the dishonest media corporations who will say anything and do anything to get people to watch their screens or to get people to pay their failing papers,” Trump said at a campaign rally in Iowa on Wednesday night. On the flight back to Washington, Trump went to the back of Air Force One and held a 28-minute off-the-record conversation with the press pool.